Having familiarized ourselves with Longcat and the implications of ultimate sacrality in the postulate "Longcat is long," today we will consider the feline internet phenomenon through the second tier of Rappaport's fourfold lens. Recall that below ultimate sacred postulates Rappaport ranks cosmological axioms: ideas about how the world is structured and functions in light of the ultimate sacred postulates which stand above such axioms. As we noted in our first discussion of Rappaport, cosmological dualisms are particularly good examples of such axioms, and in Longcat's case a readily apparent dualism exists. The alternation of light and dark is probably the most readily accessible dualism to mankind. 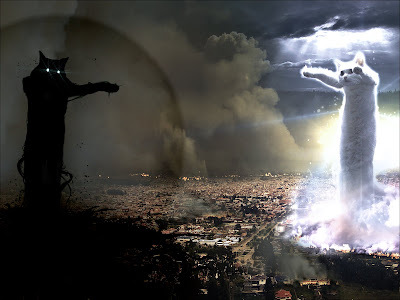 This now-famous image, commonly known as "Longcat Apocalypse," maps this natural dualism onto Longcat and its shadowy counterpart, who became known as Tacgnol ("Longcat" spelled backwards). 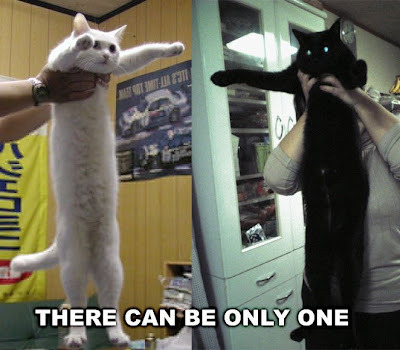 While I cannot say that I have ever heard it said that "Tacgnol is long" in the same ultimate sacred sense as "Longcat is long" (though I may have heard "Tacgnol si gnol"), the dark cat nevertheless seems able enough to stand as a cosmological counterpart to Longcat, and indeed we may speculate that it was necessary for it to do so. Longcat's sacred presence may have created something of a cosmological vacuum. That is, since the white and shining Longcat could so easily be assigned the cosmological value of "light," the very possibility necessitated the hypothetical figure of a similar entity to assume the opposite cosmological role. It is interesting to note in this regard that Longcat's primary cosmological quality is "light" rather than "long." Some attempt was made to produce a counterpart to Longcat which was more of a true opposite, namely the morbidly obese Widedog. While it seems Widedog has a small but devoted following, generally the fat pooch has not become as prolific a match for Longcat as Tacgnol. I believe two good reasons for this exist. Firstly, while "light" and "dark" are not only easily recognizable but moreover abundantly familiar cosmological characteristics, the same cannot be said for "long" and "wide." Though these qualities are formally suitable candidates for a cosmological dualism of some kind, they simply have never done duty as such (at least to my knowledge), probably because the pair does not suggest itself so clearly as light and dark, which are naturally manifested in the alternation of day and night. Secondly, employing Longcat's length as its cosmological attribute would be problematic because that very length is profoundly connected to the ultimate sacred postulate which sets Longcat up to assume a cosmological role in the first place. Longcat's being long is its ultimate sacred quality. Cosmologically opposing Longcat's length to Widedog's width would be to suggest that that length can somehow be compared with or contested by something else, which is tantamount to calling the ultimate sacred postulate into question. Longcat's source of sacrality would be destabilized. Widedog thus has no place within the religious idea system of Longcat. If anything, it could only be a separate idea system of its own — a heresy. Tacgnol, on the other hand, is able to be cosmologically juxtaposed with Longcat because, like Longcat, Tacgnol is also long (or, as I suspect cultists of the Dark Cat insist it be pronounced, "gnol"). Its presence does not threaten the ultimate sacred basis of the idea system of which it is a part. Moreover, as Rappaport reminds us, new religious ideas are seldom (if ever) made of completely new material. Tacgnol embodies the tried-and-true cosmological quality "dark" just as easily as Longcat embodies "light." The two cats are thus a stable and easily comprehensible cosmological duality. 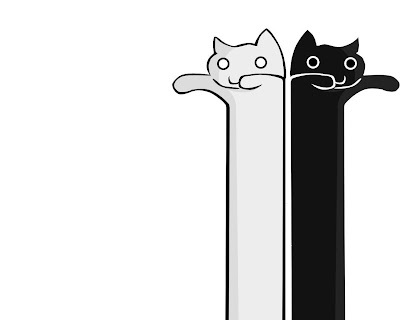 However, juxtaposition with Tacgnol is not the only popular portrayal of Longcat with cosmological overtones. In the previous post I promised that I would only post an image as absurdly large as the 15,200-pixel extended Longcat once more. Now I must fulfill that threatening vow. Before viewing the below image, note that in the manner it is here presented, it is somewhat backwards. That is, as the "START" tag at the bottom explicitly tells us, the image is meant to be read from bottom to top. I suggest the reader scroll down and do so before continuing. Also note that, as is the case with many images from the internet, this bizarre graphical smorgasbord probably contains something you might be inclined to find offensive (or at least gross). Please bear in mind that as scholars we must be respectful of the religious imagery we study, and of the conceptions of the universe reflected therein. As this image represents the entire cosmos, it is only natural that some parts of it may be found unpleasant. As always, feel free to register any and all of your thoughts about our subject matter by posting your comments. Although it is very clear where to begin with this image, there is so much to be said that one finds oneself somewhat at a loss for words. As such, I will simply list a number of cosmologically salient points along the image before attempting to discuss it as a whole. The image begins in Hell, with Longcat's feet firmly planted in a stylized fiery abyss identified by its impish population. This beginning is part of what I take to be the overall statement of the image: that Longcat spans, penetrates, and transcends all other cosmological systems. Longcat passes through a number of classic video gaming environments, including an early Mario Bros. game and StarFox, locus classicus of the famous suggestion "Do a barrel roll!" (As well as "Use the boost to get through!") In my Junior Seminar paper on video games and religion (which perhaps I'll post sometime), I argued that video games were of interest to scholars of religion primarily because, like religious idea systems, they created mediated imagistic worlds and allowed people to interact with those worlds. As such, the shared culture of video games is much like the shared culture of religious adherents. From this perspective, the environments of Mario Bros. and StarFox are themselves cosmoses which Longcat transcends. In a similar vein, Longcat briefly passes through the cosmos of Disney's Alice in Wonderland. Before leaving the atmosphere, Longcat passes by a stereotypical figure of Christ standing on a cloud. (The stigmata evident on his raised left hand provides clear identification.) While the scene is otherwise an unremarkable sky, Christ's presence may indicate that it is to be taken as the Christian Heaven. Before reaching an isolated sign indicating the end of the universe, Longcat penetrates a layer of green binary code on a black background, a motif reminiscent of The Matrix, here suggesting that Longcat breaks through the computer-generated reality of the film's cosmos. Longcat passes by some graph paper with Einstein's relativity equation and some other math on it, seeming to burn the paper. While modern science claims to be fundamentally different from religious idea systems inasmuch as it tests its claims to truth empirically, it is nevertheless an idea system with its own notions of cosmos. I speculate that Longcat's burning by these mathematic scribblings intimates its transcendence of science along with every other ordered conception of the universe. Erupting from a volcano, Longcat then emerges from the tundra which the smoke becomes. The dualism of hot and cold is transcended. Passing through outer space, we appear to reach Longcat's head and forepaws meeting up with its feet planted in Hell, only to have the repeated bottom of Longcat drawn into a spiraling "wormhole" (again in outer space) and reemerging to continue its journey upward. I am uncertain whether the image may have originally ended here, with the wormhole being added later to segue into additional extensions. Longcat blasts through some 4chan posts which themselves appear to have the image itself attached to them, as if Anonymous had posted the entire image (so far). Here the transcendence of the 4chan cosmos is explicit. Longcat disrupts the Japanese video game Chu Chu Rocket (whose raucous TV commercial became a popular internet video clip), breaking through yet another cosmos, though a minor one. Longcat pierces the throat of the Shoop Da Whoop face and becomes the beam it emits. This face is a prolific meme in its own right, another online god, who here is subsumed to Longcat. Finally, Longcat's front end floats in a grey and featureless emptiness. As these notes suggest, I regard the image as a whole to be a grand statement of Longcat's transcendence. Every ordered conception of the world — every cosmos — which the image presents is threaded through by Longcat, not only indicating that Longcat literally transcends all other conceptions of the world, but perhaps also suggesting that Longcat informs them even as it passes through them all. In this transcendent mode, Longcat trumps every other idea system's cosmos, spanning and breaking through Heaven and Hell, terrestrial and celestial planes, heat and cold, the real and the imagined, the ridiculous and the sublime, the empirical and the subjective, through all distinction, differentiation, and dualism — in a word, through all cosmological systems. While Longcat still seems to be associated with the cosmological quality "light" in this image, Tacgnol is nowhere to be seen. Longcat is portrayed here trans-cosmologically, and indeed we may be compelled to regard this work as a sort of fetish or totem, than icon of the ultimate sacred postulate "Longcat is long." Tellingly, Longcat's head emerges in a featureless greyness, a non-dualistic void — the only place where the ultimate sacred postulate, itself over and above all cosmology, can be represented. The transcendent mode, in which Longcat alone represents the ultimate sacred postulate "Longcat is long." While such imagery is unquestionably cosmological, it remains to be seen whether Longcat can support a full-fledged cult, which is to say whether it can produce rules of conduct proceeding from its cosmology and the ultimate sacred postulate behind it. To this possibility our attention shall turn in the next post. so, now your about to start the church of longcatologoy, are you? I'm not much interested in starting any kind of church, just observing the natural development of the phenomenon. Of course, if somebody did start an institutional religion centered around Longcat, it'd be fascinating not only to analyze that church's growth, but even more to see the popular response to that institutionalization. I WANNA STAR A LONG CAT CHURCH ( all hail long cat) id be in it from the star!! The LOLcat Bible is certainly along these lines, yes.